Today I wanted to share another of the treats I sent in the holiday gifts this year. 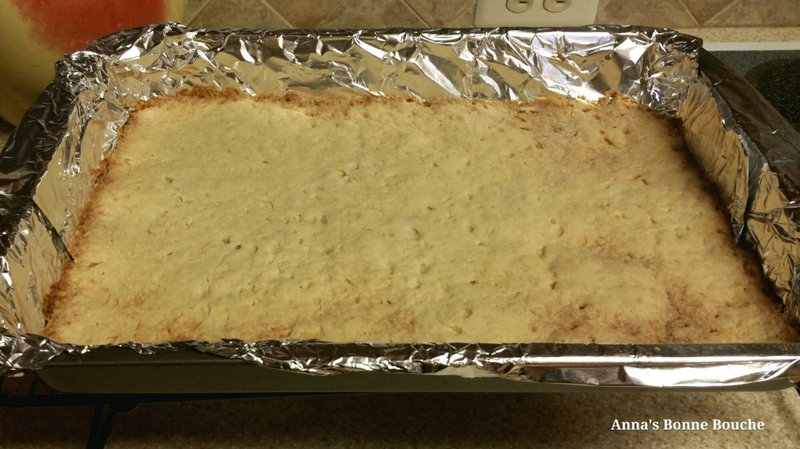 This cookie bar is my most requested cookie during the holidays. These bars have a wonderful combination of sweet and salty flavors, and a chewy, sticky texture that people find irresistible. The only complaint I have ever heard about them is that I never send enough of them in the boxes. Well, for those people, I post THE RECIPE, so that you may have these delectable cookies anytime your heart desires. 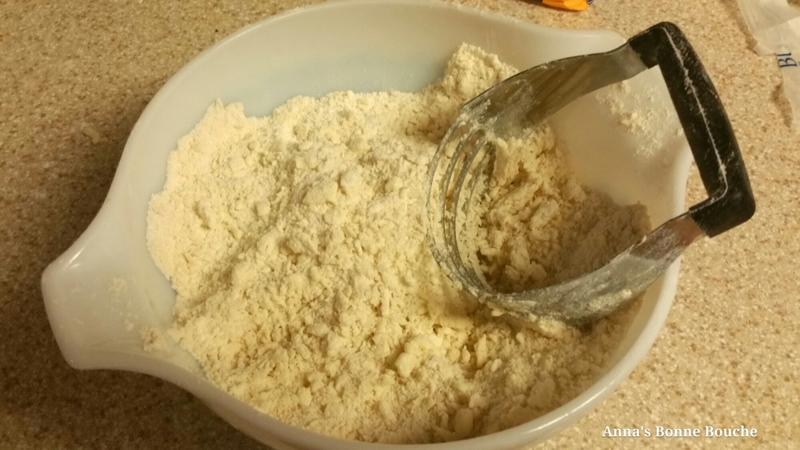 In a medium bowl, combine flour and 1/2 cup sugar, mix well. 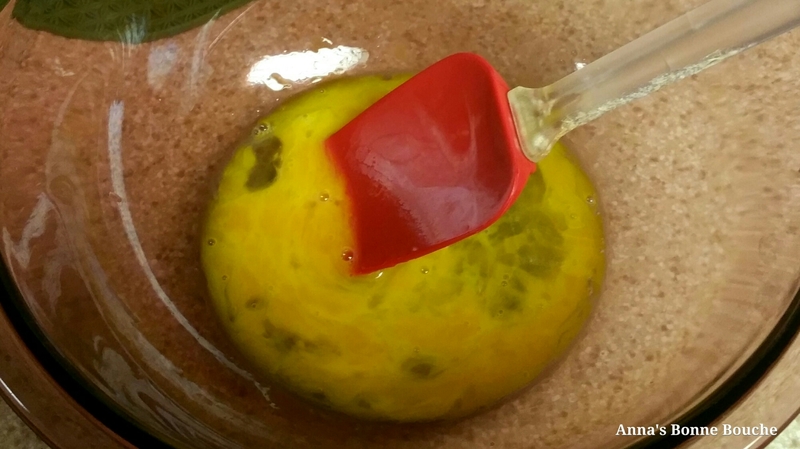 Cut in 1 cup cold butter with a pastry blender, until mixture resembles course crumbs. 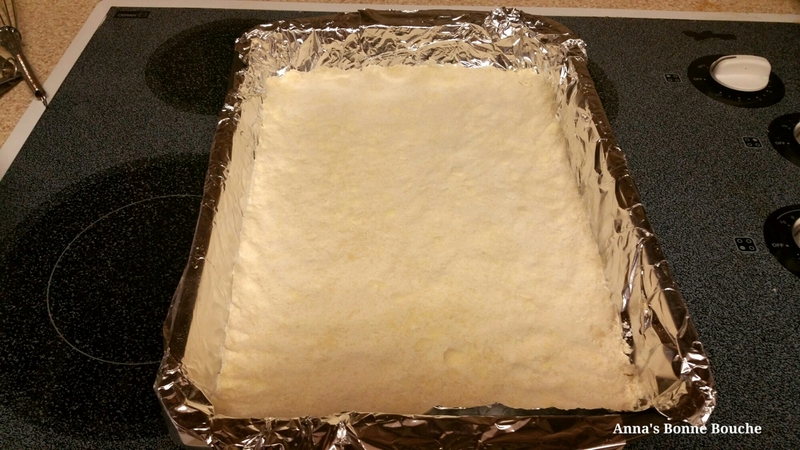 Press mixture into the bottom of a greased 13×9 baking pan. I like to line my pan with foil to ease removal of the bars from the pan for cutting. 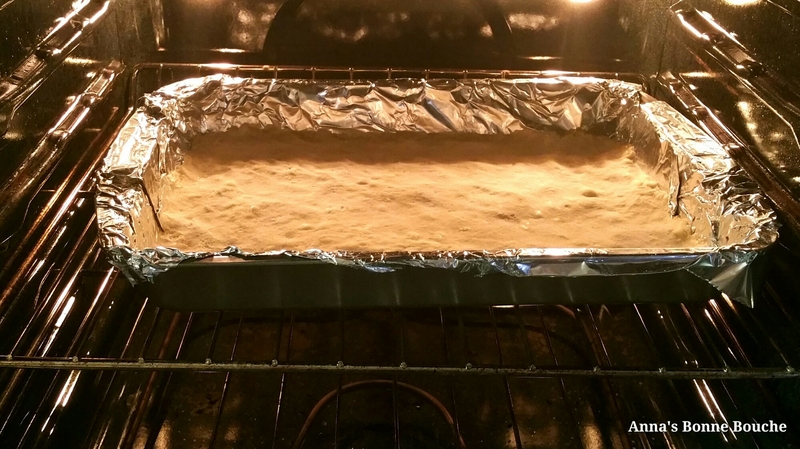 Try to press the crust in as evenly as possible. Bake at 350°F for 20-25 minutes, until light golden brown. Meanwhile, in large mixing bowl, lightly beat eggs. 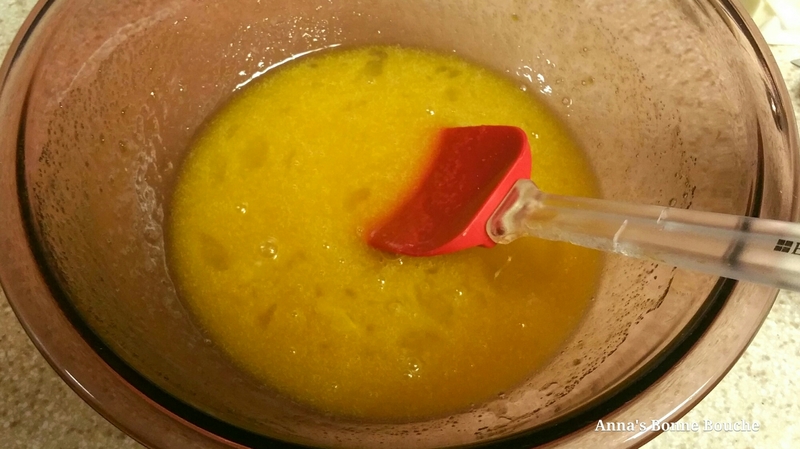 Add sugar, corn syrup, butter and vanilla to eggs and mix well. 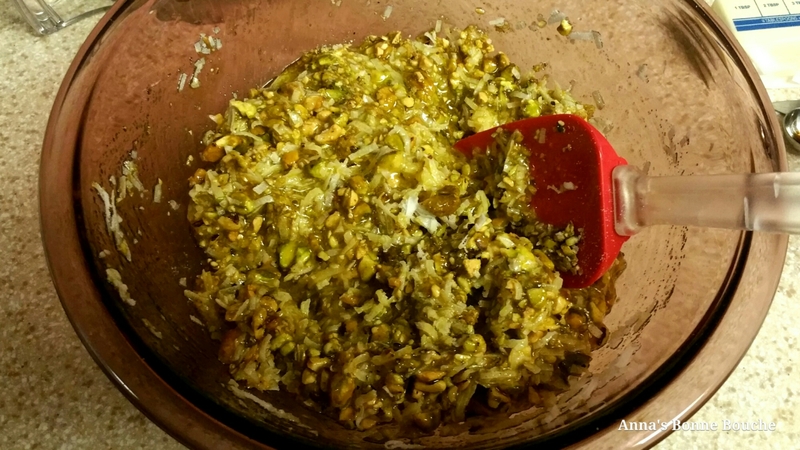 Add pistachios and coconut to mixture and mix until throughly combined. Cool crust on a wire rack for 10 minutes. Above, you can see the reason why the crust needs to be evenly pressed. Don’t worry of you do get some darker spots. As long as it isnt burnt, no one will notice once the topping is on it. 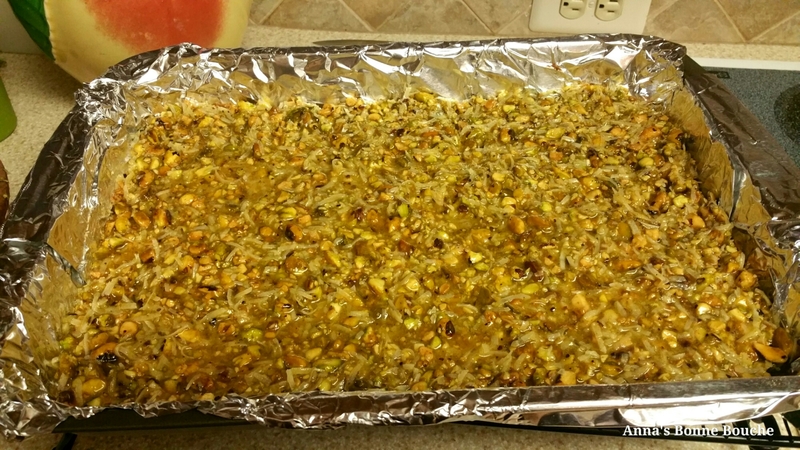 Spread pistachio topping over warm crust as evenly as possible. Be careful as you spread it over, that you do not pull up the crust. 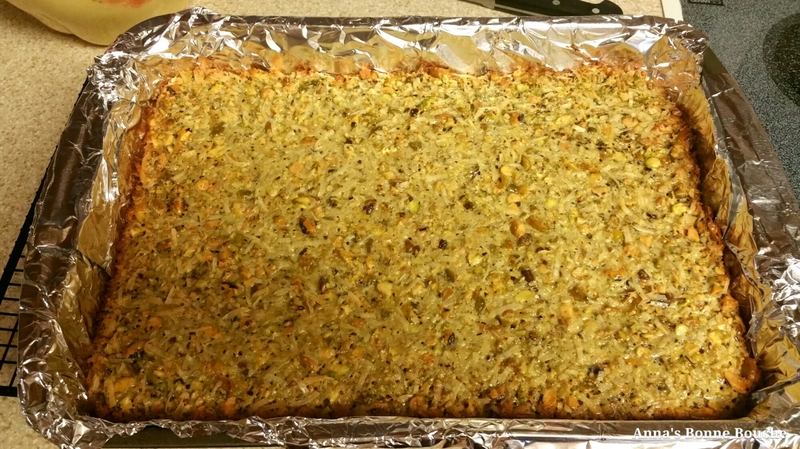 Return pan to oven (350°F) for another 15-20 minutes, until the edges are golden brown. Allow to cool on a wire rack for at least 1-1/2 hours or until completely cooled. Cut into bars. I truly enjoy these cookies, and look forward to making them every year. Though I will admit I have a love for all things pistachio. Cookies, pudding, ice cream, even raw eating, those little green wonders really make my palate happy. 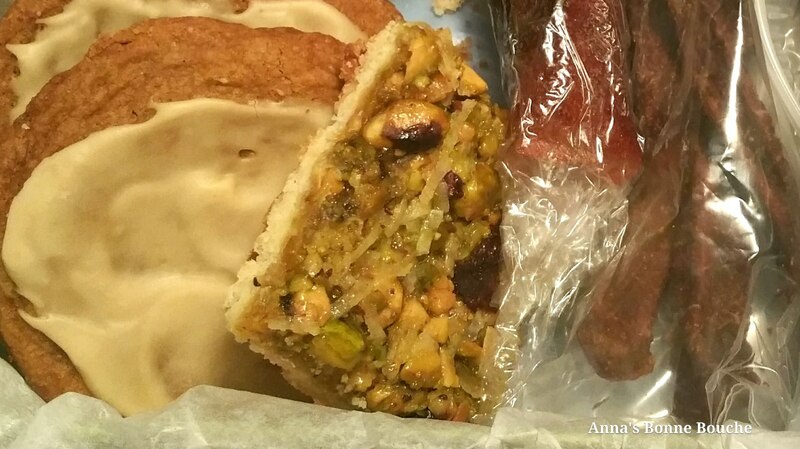 Now that I have given away my secret I will have to come up with some new recipes for goodies in next year’s boxes. That’s part of the fun, though, because it requires experimentation. Experiments mean we will be tasting many goodies to see if they make the cut for special gifts. It will be hard, I am sure, forcing down all those new cookies and candy. I am willing to make that sacrifice for my friends and family, so that they may enjoy a little something special during the holidays.